Of Austro-Hungarian origin, Gerhard arrived in England in December 1938 as a refugee from Nazi persecution. After school in Yorkshire and a spell as a telephone engineer in London, he joined the Royal Air Force as a wireless operator. He completed a tour with 214 Squadron of RAF Bomber Command in 1944, followed by service with a transport squadron in the Far East until his release in the spring of 1947. He then entered civil aviation, gained his commercial pilot’s licence in 1954 and got his first command three years later. 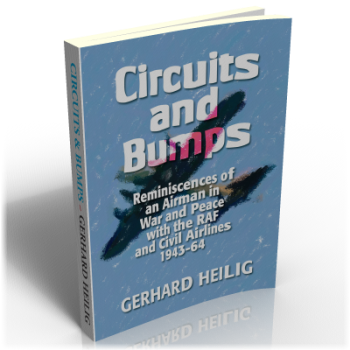 In this enjoyable autobiography, he recalls his experiences and the many remarkable people with whom he came into contact in the course of his youthful exile from his homeland, his subsequent wartime flying duties with the RAF and postwar career in civil aviation. Enlivened by many amusing anecdotes and illustrated with black and white photos, it is an interesting and illuminating account of the author's early life that will appeal to a wide variety of readers, especially those old enough to remember the wartime years. Of Austro-Hungarian origin, Gerhard Heilig arrived in England in December 1938 as a refugee from Nazi persecution. After school in Yorkshire and a spell as a telephone engineer in London, He joined the Royal Air Force as a wireless operator. He completed a tour with Bomber Command in 1944, followed by service with a transport squadron in the Far East until his release in the spring of 1947. He then entered civil aviation, gained his commercial pilot’s licence in 1954 and got his first command three years later. At the end of 1964 he took up a tempting offer by Austrian Airlines, moved to Vienna and has lived there ever since.